Eye-catching robin’s egg blue solo dress that still looks wonderful on stage! 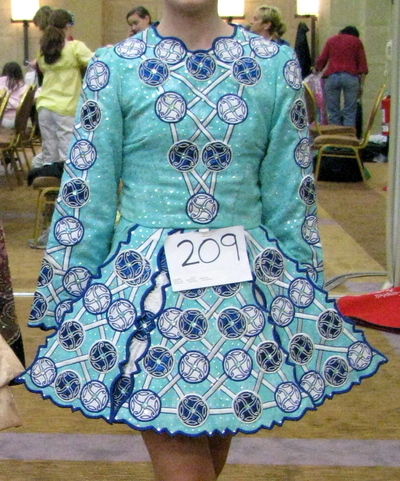 The embroidery is a blue and white sequined celtic design that is VERY current. Lots of diamontes added, so it sparkles in any lighting. The lining is a silver tiger pattern, and the dress comes with new silver bloomers and a headband. This dress has been stored flat in a non-smoking home and has no odor. Asking Price: $US125. Shipping costs are included. Will accept returns and refund the cost of the dress, buyer to pay all shipping costs.